CRCBR programs offer maximum opportunity for member networking. Browse our list of programs below, mark your calendar and make plans to join us at one of our upcoming events! Deal Makers Awards Program (Feb)– Annual recognition for top producers in commercial real estate throughout the Charlotte region. 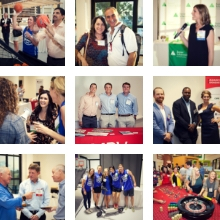 Member Networking Events (Year-round)– Exclusive members-only networking events offer an opportunity to mingle with other commercial real estate industry professionals. Economic & Legislative Updates (Year-round)– Team up with other industry organizations to network and receive timely commercial real estate specific information. Annual CRCBR/NAIOP Charlotte Clay Shooting Tournament (Apr)– A unique networking opportunity for members and clients. This event is in conjunction with NAIOP. Commercial Spotlight (Aug)– Tradeshow displaying the latest commercial real estate projects underway in Charlotte, plus meet Corporate Associate service providers. Annual CRCBR/NAIOP Charlotte Golf Tournament (Sept/Oct)– Largest industry golf tournament includes networking and prizes. This event is a partnership with NAIOP Charlotte. Annual Meeting (Dec)– Final meeting for the year which includes the election of new board members, keynote address, and awards presentations. View our calendar of events to see our current list of programs and keep checking back for more details on upcoming CRCBR events!